In The Infinite Image Zainab Bahrani maintains that concepts of art and the aesthetic already existed in antiquity, particularly in Mesopotamia, but more generally in the Near Eastern and Mediterranean world. This position is contrary to current scholarship, which has widely come to define art as a modern, and even a purely Western category. Yet in the early twentieth century, artists like Alberto Giacometti and Henry Moore and intellectuals such as Georges Bataille were captivated by the Mesopotamian sculptures they encountered newly displayed in Western museums. This book dissects the accepted eurocentric definitions of art and aesthetics and argues that there is a tie between images, historical time and the work of memory, which the ancients, especially in the Near East and in Greece before the age of Plato, understood to be an integral part of representation. It contends that art as a concept meant to break through the boundaries of time and transcend the place and moment of creation. Ancient images and monuments constituted an aesthetic dimension that was by definition both diachronic and boundary breaking. They asserted their presence as ontological beings in the world, and counter definitions that currently dominate art theory and aesthetics. This book addresses issues at the centre of contemporary history and anthropology of art. It engages with important questions of the politics of cultural heritage, particularly salient in the context of current instabilities in the Middle East. 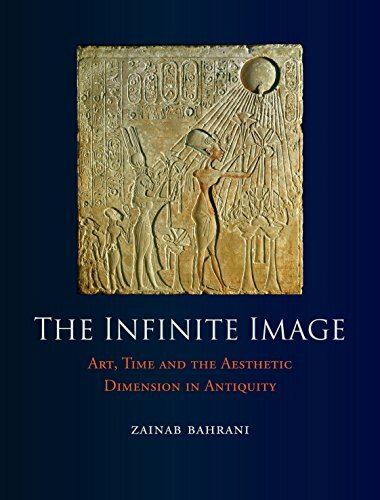 Zainab Bahrani s "The Infinite Image" is at once a massively important contribution to the study of ancient Mesopotamian art and a brilliant intervention into the history and theory of art and aesthetics. It decisively overturns the deeply entrenched cliches that regard art as a uniquely western European invention. But it also mobilizes a rich array of textual sources to reconstruct the whole discourse around images and their cultural lives in the ancient world, a discourse that will strike many readers as having an uncanny timeliness in the era of the pictorial turn. Magnificently illustrated with images from the ancient, classical, and modern worlds, this book will be essential reading for scholars of art history, visual culture, aesthetics, and iconology. --W. J. T. Mitchell, author of Seeing Through Race"
Zainab Bahrani s The Infinite Image is at once a massively important contribution to the study of ancient Mesopotamian art and a brilliant intervention into the history and theory of art and aesthetics. It decisively overturns the deeply entrenched cliches that regard art as a uniquely western European invention. But it also mobilizes a rich array of textual sources to reconstruct the whole discourse around images and their cultural lives in the ancient world, a discourse that will strike many readers as having an uncanny timeliness in the era of the pictorial turn. Magnificently illustrated with images from the ancient, classical, and modern worlds, this book will be essential reading for scholars of art history, visual culture, aesthetics, and iconology. --W. J. T. Mitchell, author of Seeing Through Race"